The impressive scale of creativity and advanced technical means of ancient humanity is on full display in all parts of the world, including those Paleolithic landscapes now submerged by oceans. Ancient megalithic sites are now being reconsidered in light of the recent discoveries of geopolymer chemistry suggesting many megaliths may actually be synthetic products made from reconstituted stone cements. 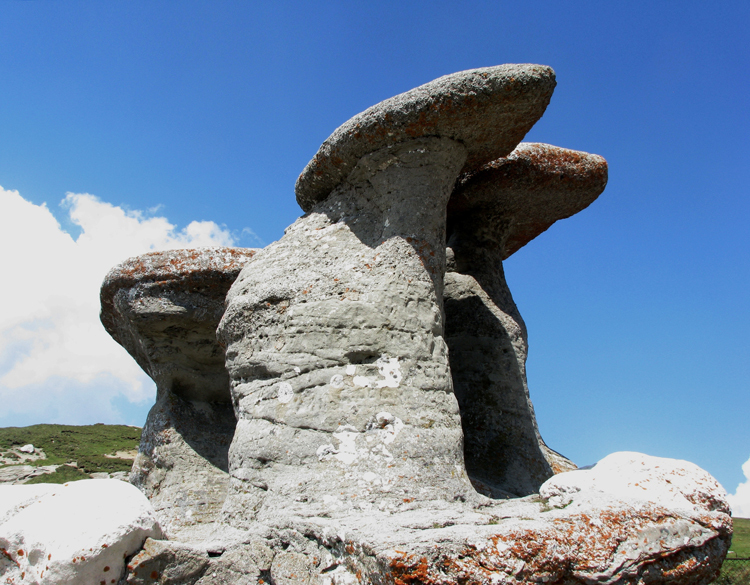 Unusual stone formations such as those in the Bucegi Mountains of Romania, at sites such as Babele (above), evoke a sense of wonder at monumental forms that most people simply attribute to the activity of natural forces, yet may in fact represent the skilled achievement of ancient Paleolithic builders. Geopolymer stone structures can now be clearly identified by paleomagnetic and microscopic analyses of the stone matrix for anomalous characteristics, especially the presence of exotic constituents. 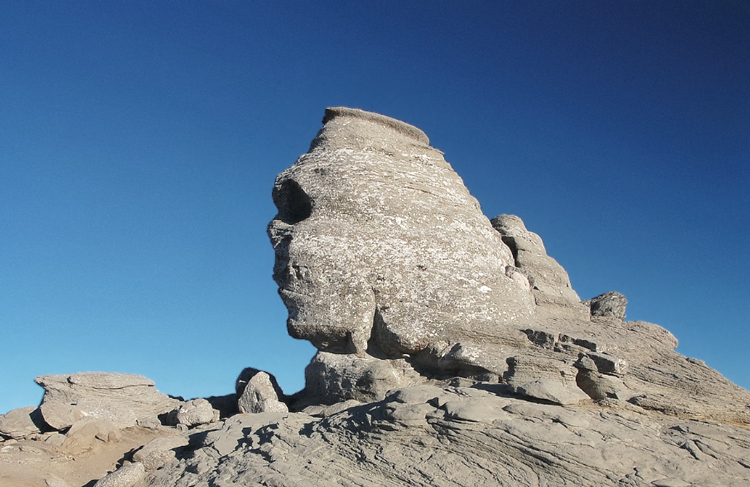 Such analyses may explain architectural features of many so-called natural rock formations, and perhaps confirm the mold-made origin of huge sculpted rock outcroppings such as the Bucegi Mountains Sphinx (above). The specific density and microscopic composition of the stone may reveal the telltale signs of ancient artists' creative processes that effectively replicate the appearance of natural stone. Advanced ancient cultural knowledge exhibited in megalithic geopolymer constructions worldwide belies a collective awareness shared among all Paleolithic cultures regarding the sophisticated physiological effects induced by monumental stone masterworks. The material remains of Paleolithic and Neolithic societies from the Balkan region of Europe include many ceramic objects with explanatory texts that directly relate this sacred Atlantean knowledge of the health benefits of induced bioelectrification. Giant temples were exclusively constructed from stones possessing piezoelectric properties for transducing local infrasound into an enhanced electromagnetic field surrounding the monument. Such megalithic sites were always utilized by barefoot initiates who accepted the bioelectrical granting of planetary infrasound resonance received through the exposed soles of their feet. This sacred practice of barefoot ambulation within temples has been maintained at indigenous sacred sites throughout the world, and was expressed in votive passages on ceramic and sandstone objects recovered at the Bosnian Valley of the Pyramids and at various sites from diverse Neolithic groups in the Balkans including the Starcevo-Cris, Cucuteni-Trypillia, Turdas-Vinca, Villanova, and Lepenski Vir cultures. All of these closely related societies of the Neolithic expressed themselves with a single language form that was collectively inherited from the greater ancestral culture of Atlantis that once flourished during the Paleolithic Era. 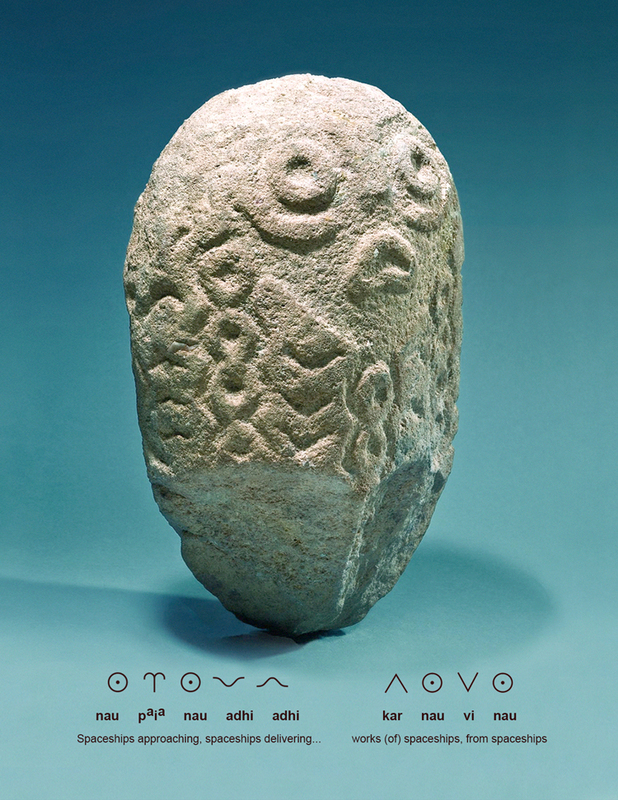 One of the most beautiful art objects from the Balkan region crafted by Neolithic artists at Starcevo-Cris is a ceramic stamp representing a lower leg and foot. Nested lines of carefully engraved Paleo-Sanskrit hieroglyphs read: vi vi karikr kar kar kar --"Through making tribute to triple works" (above). The meaning of this statement cannot be grasped without particular cultural context: praising sacred bioelectrical contact between bare feet and piezoelectric stones. 'Triple works' is an Atlantean reference to tri-frequency infrasonic rumbling focused by the three giant pyramids of Giza, Egypt. 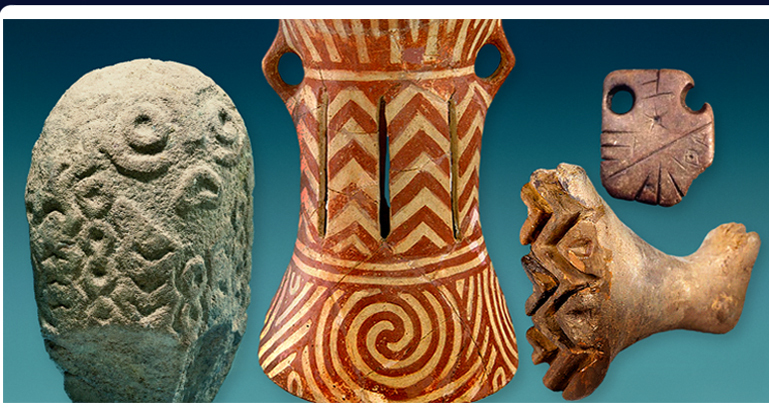 Similar psychoacoustic references have also been painted onto many other functional objects among the recovered relics of the Cucuteni-Trypillia culture, known from sites in the Black Sea region. 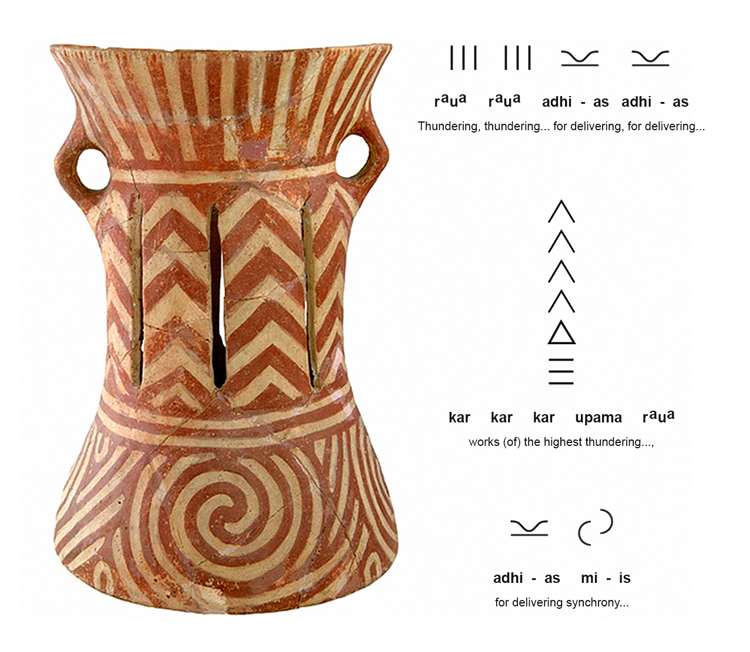 A ceramic hand drum was covered with mesmerizing patterns in red and beige glaze paints that express clear Paleo-Sanskrit phrases that have not been previously recognized. A three-part votive passage starts along the upper rim where the drum skin was once fixed, stating the exact function of that portion of the sacred instrument: raua raua adhi-as adhi-as --"Thundering, thundering... for delivering, for delivering..." (above). The central portion of the drum text reads: kar kar kar kar upama raua raua --"Works of the highest, works of the highest..., thundering, thundering..." in reference to infrasonic booming transduced and focused by the highest free-standing pyramid at Giza. Pictograms circumscribing the beveled base of the drum present a hypnotic double spiral symbolism that reads as 'mi-is', visually conveying the advanced concept of interlocking hemispheres. This ligature references the brainwave entrainment effect of the Great Pyramid and the psychoacoustic function of the resonant ceramic drum itself: biorhythmic synchronization (see Appendix I). Glyphs signifying 'for delivering' are given on either side of each of four psychedelic double spirals, directly identifying the specific function of the drum: raua raua adhi-as adhi-as kar kar kar kar upama raua raua adhi-as mi-is --"Thundering..., for delivering..., works of the highest thundering..., for delivering synchrony..." (above). 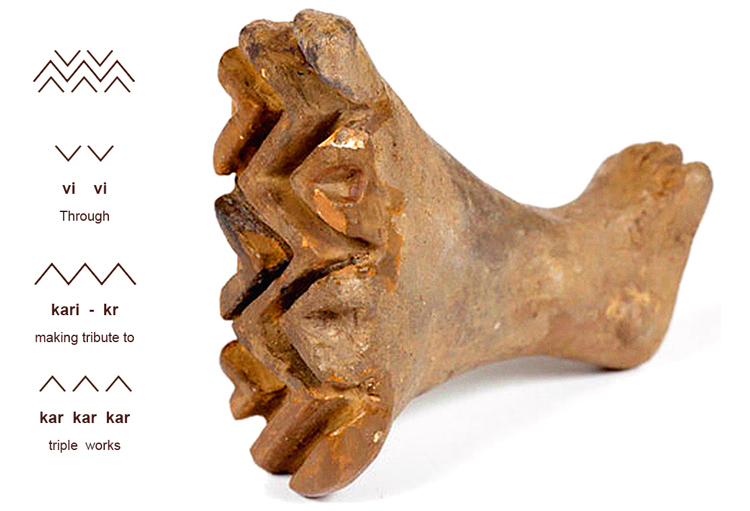 This psychoacoustic interpretation of the 'mi-is' ligature that literally means 'waning/waxing' is supported by other ceramic artifacts from the Cucuteni-Trypillia culture, including several examples of fine votive figurines that reference the same concept. 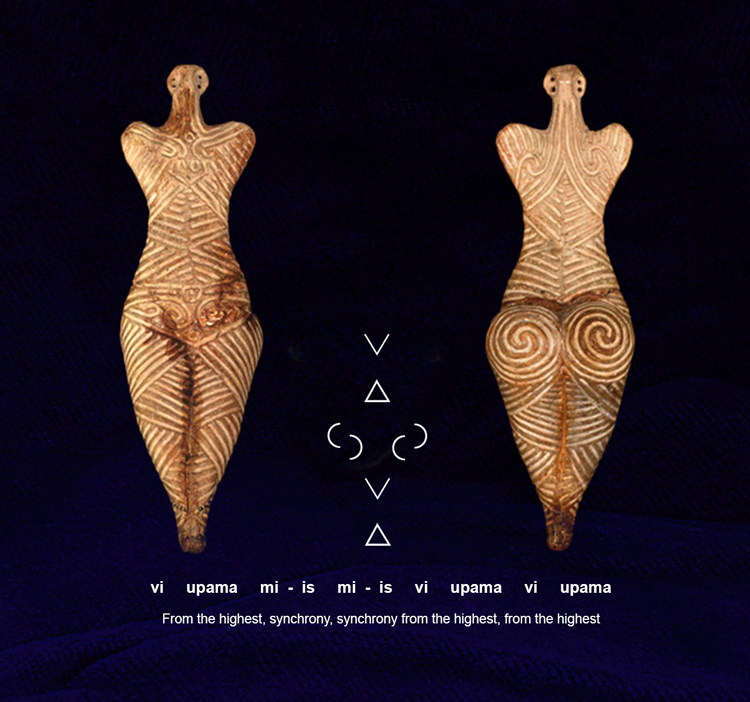 An intricately inscribed figurine was hung on a cord as a pendant, presenting a vertical line of hieroglyphs reading: vi upama mi-is mi-is vi upama vi upama --"From the highest, synchrony, synchrony from the highest, from the highest" (above). Mesmerizing curves of the female posterior were associated with bioelectrical contact while sitting within stone chambers for receiving biorhythmic synchronization from the Great Pyramid, depicted in full three-dimensional form on the figurine's abdomen, back and thighs. 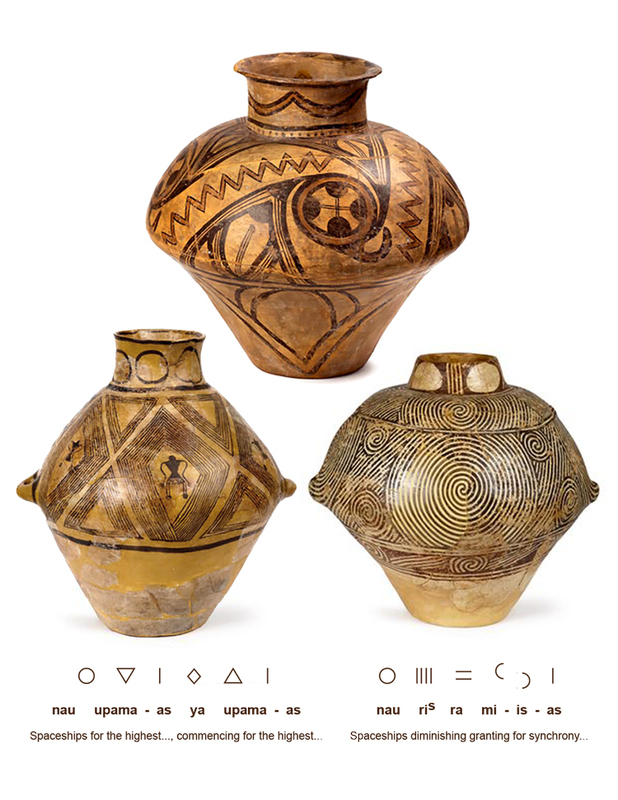 Statements concerning synchrony also adorn magnificent ceramic vessels, the largest reading: nau ris ra mi-is-as ra mi-is-as ra mi-is-as --"Spaceships diminishing granting for synchrony, granting for synchrony..." (above). Another large example gives the statement: nau upama-as ya upama-as --"Spaceships for the highest, commencing for the highest." 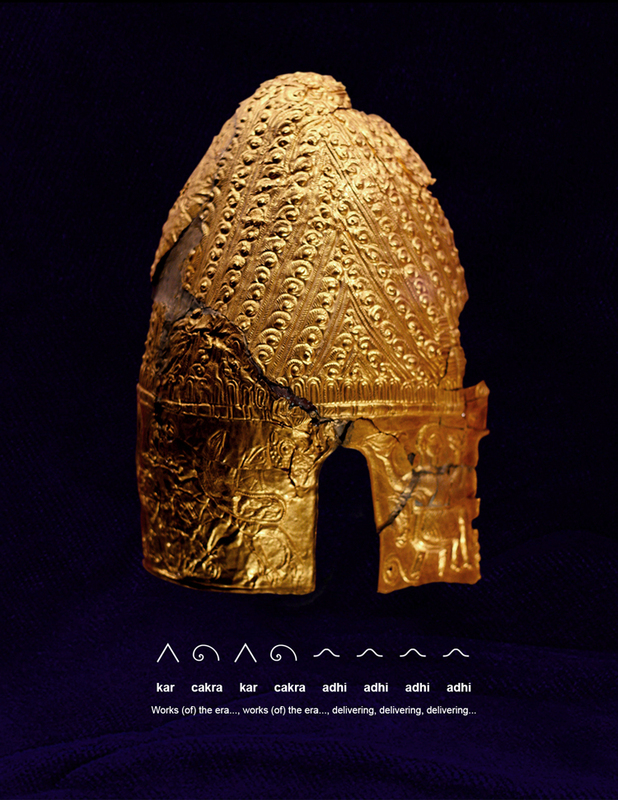 Enigmatic statements concerning brainwave entrainment were also carefully hammered into delicate gold helmets that were specifically shaped to accommodate skulls with an extreme vertical elongation. One partially damaged example displays the phrase: kar cakra kar cakra adhi adhi adhi adhi --"Works of the era, the era..., works of the era, the era..., delivering, delivering..." (above). 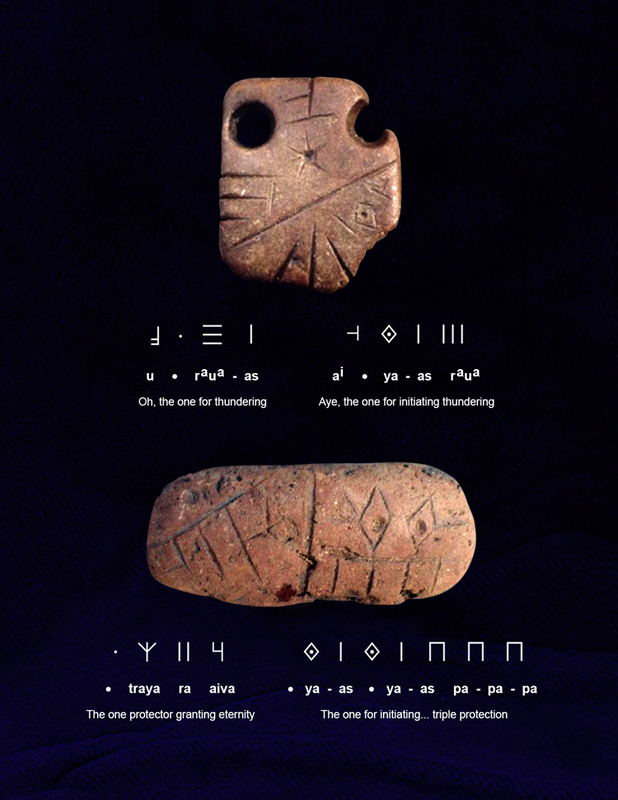 A pair of small votive amulets discovered among over 120 tablets dated to ~9,300 years of age in Farcasa Rau Vadu, in the Bucegi Mountains of Romania, were inscribed with very fine geometric hieroglyphs that also praise the psychoacoustic effects of infrasound resonance (above): u * raua-as ai * ya-as raua --"Oh, the one for thundering. Aye, the one for initiating thundering." The second oblong amulet text praises the 'triple protection' of infrasound from three pyramids: * traya ra aiva * ya-as ya-as pa-pa-pa --"The one protector granting eternity. The one for initiating... triple protection." Paleolithic and Neolithic skeletal remains from the Balkans display enhancements that constitute solid evidence for psychoacoustic cranial elongation processes so repetitiously praised in Paleo-Sanskrit terms. 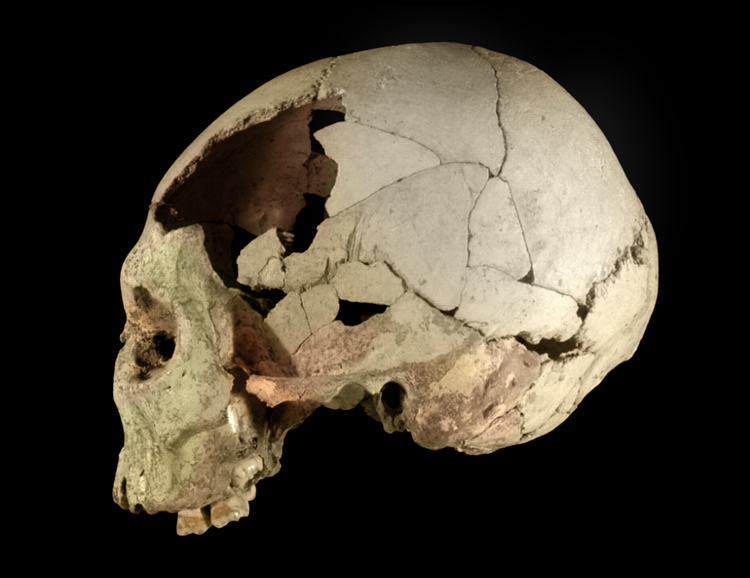 An unusual skull from Romania, dated to 35,000bp, belongs to an oversized humanoid species referred to in the Bible as the Nephilim, now identified by craniometric and genetic analysis (above). The distinctive combination of cranial features include hooked protrusions of the zygomatic arches, an increased bone thickness, a very heavy jaw and a considerable enlargement of the occipital lobe of the brain associated with infrasound reception. Occipital enhancements such as this were achieved through infrasonic induction of neurogenesis, the state of brain cell growth associated with deep meditation and hemispheric synchronization of the brain in subterranean chambers or within pyramids. 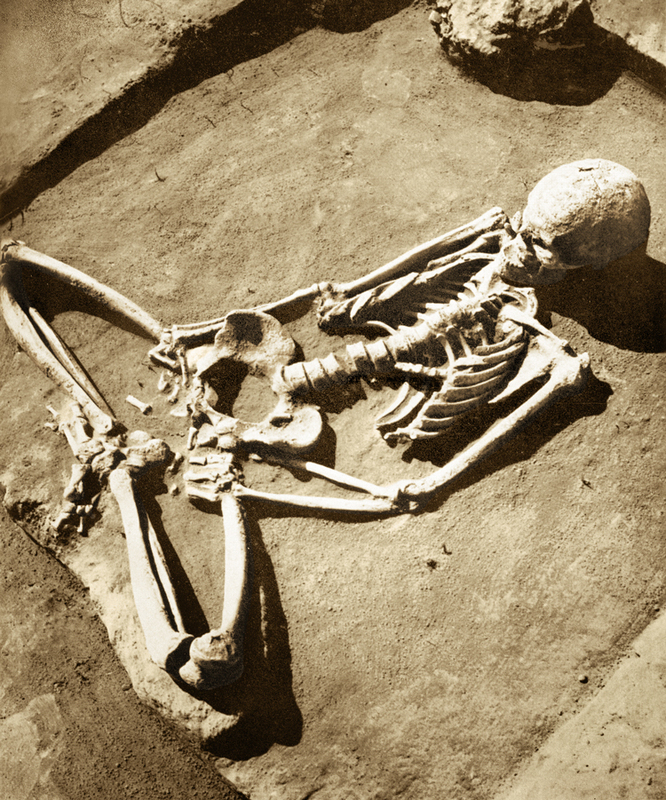 Extensive skeletal evidence supports the mixing of descendant human cultures of the Neolithic period in Europe with backcrossed descendants of Nephilim/human hybrids, as directly stated in the Bible. 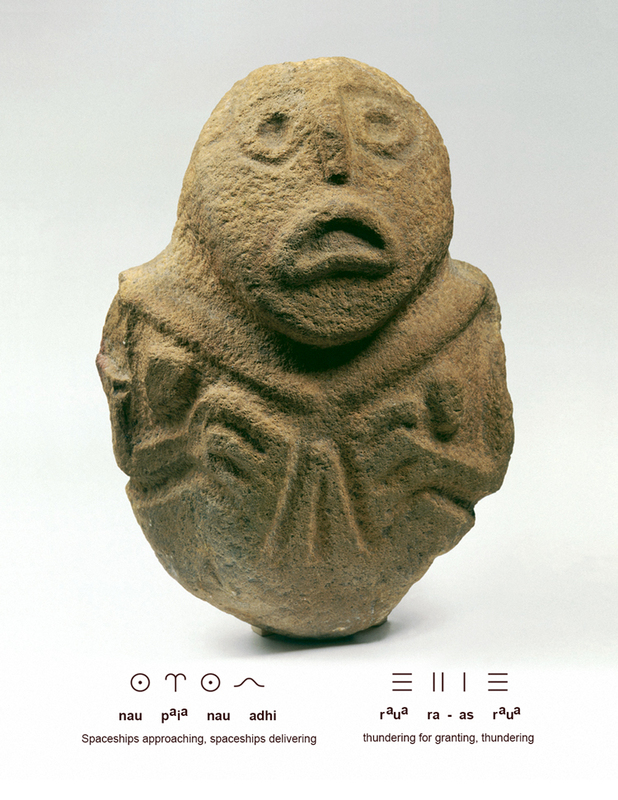 A Neolithic habitation site located on the Danube River in Serbia, called Lepenski Vir, preserves bones, granite altars and sandstone sculptures bearing faces with engraved Paleo-Sanskrit texts. A large skeleton excavated in the meditative lotus position displays the strong features of a Nephilim hybrid backcross, with large hooked protrusions on the zygomatic arches, a heavy jaw and the same occipital enlargement observed in so many other specimens of this 'foreign' humanoid species (above). Preliminary results reported on forthcoming mitochondrial DNA analyses of elongated skulls from the Paracas culture of present-day Peru have confirmed cranial indications that this oversized species of humanoid belongs to a technologically advanced collective of extraterrestrial species that appeared in great numbers at multiple periods in the long and sordid history of the Atlantean civilization. While this reality has been entirely marginalized by archeologists and anthropologists for several decades, the weight of suppressed DNA findings confirms Biblical statements regarding this non-terrestrial species. Emerging genetic evidence also provides strong support for the linguistic decipherments of the Paleo-Sanskrit language that also directly reference many advanced technological capabilities of the Atlantean civilization, including explicit statements on the presence and specific functions of spacecraft that were later echoed in the hymns collected in the Vedas and Upanishads of Neolithic India. 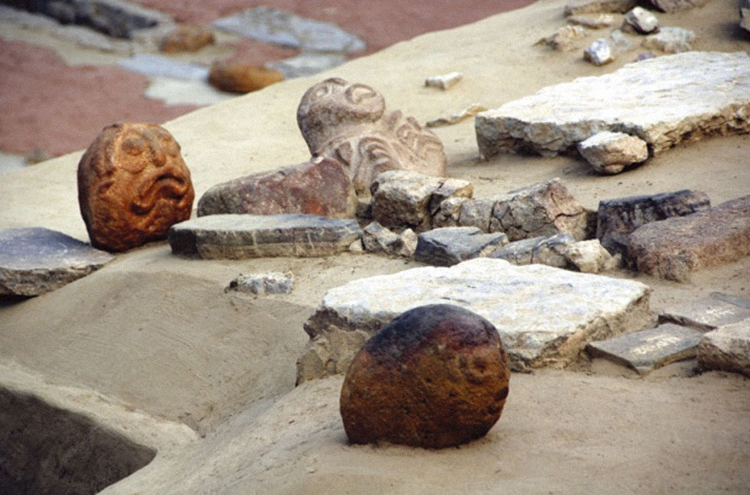 Small granite altars and curious stone figures uncovered at Lepenski Vir actually reference the presence of advanced spaceships throughout Earth's skies, though seen in greatly reduced numbers, and were still widely recognized by Neolithic societies in all parts of the world. Granite receptacles for energizing water through piezoelectric transduction of infrasound by quartz crystals formed the third-eye symbol for the ajna chakra, also reading as: adhi nau adhi --"Delivering, spaceships delivering" (above). 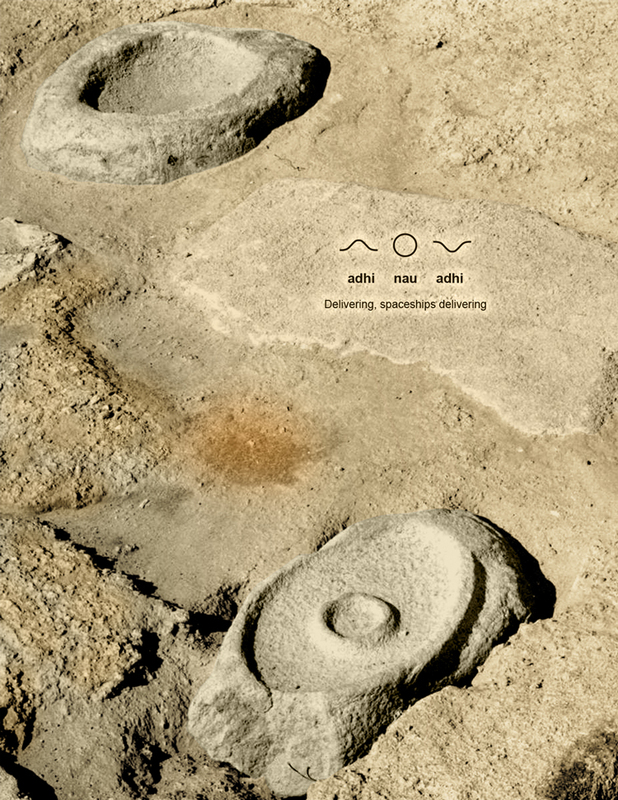 Round stone figures were embedded with similar hieroglyphic phrases on the bioelectrical functions of spacecraft in delivering the beneficial vital force of infrasound resonance: nau paia nau adhi raua ra-as --"Spaceships approaching, spaceships delivering..., thundering for granting" (below). Taken altogether, the ligature sets form a simplified face with mouth agape in an unmistakable expression of utter dismay, as if staring up at the impressive sight and sound of an approaching fleet of roaring spaceships! 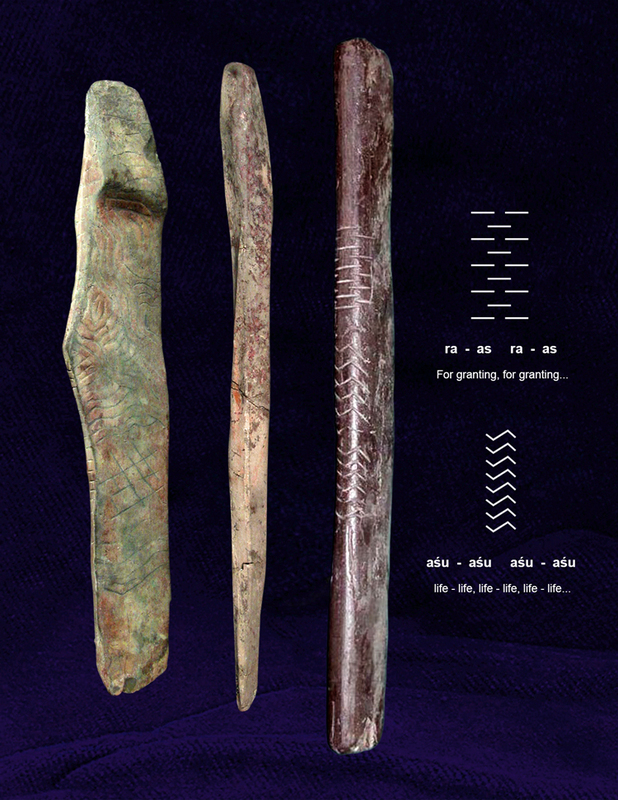 Three long stone batons were among several other artifacts with hieroglyphic inscriptions excavated from shallow depths below the sands of the Danube riverbed site at Lepenski Vir. 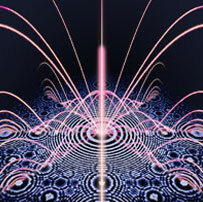 Wave and grid patterns cover one of the batons, while another has been marked with repeating glyph lines reading: ra-as ra-as ra-as asu asu asu --"For granting, for granting, for granting..., life, life, life..." (below). Displaying all the characteristics of geopolymer stones cast in a mold from a black sand slurry, these very hard basalt batons were likely used as musical instruments: lithophones that would resonate with the strike of a wooden mallet. Similar lithophones have been recovered at megalithic sites such as Stonehenge that possess the same sonorous crystalline properties as the giant standing stones that were geometrically arranged and precisely geopositioned for the transduction of focused planetary infrasound resonance. 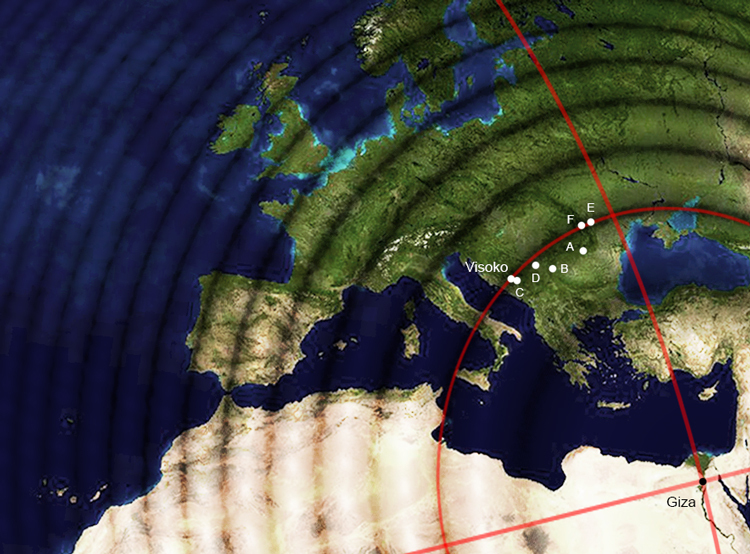 Spherical mapping of nonlinear standing wave resonance patterns reveals the general alignment of ancient sites along the resonant 4.8% distance band marked by the Bosnian Pyramid of the Sun, where the breadth of infrasound wavelengths are focused by the Orion pyramids of Giza, Egypt (above). The geopositioning of ancient habitation sites confirms advanced geometric and hieroglyphic information embedded in stone, metal and clay works that relates the deeply felt acoustic forces that synchronize human consciousness and vitalize all life.